Genetic data are increasingly used for fast, efficient, and cost-effective monitoring of natural populations and assessment of extinction risk in species management. A single modern molecular snapshot is typically used to infer population size and vulnerability, yet for species with unknown and potentially complex genetic metapopulation structure, this technique may not effectively predict vulnerability. Darwin’s finches, which are well-represented in museum collections, offer a unique opportunity to test the effectiveness of predicting extinction vulnerability in species with complex structure, such as naturally fragmented populations. 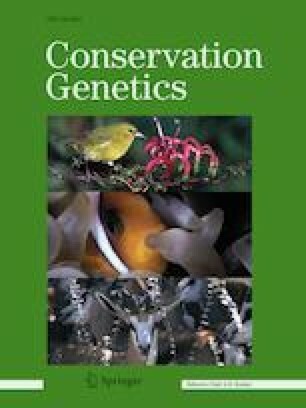 In this study, we compared ancient DNA from ~ 100 year old extinct and extant Darwin’s finch populations in the Galápagos Islands to determine whether single time point genetic assessments in the past accurately predicted extinction risk, or if other factors such as metapopulation dynamics could mask population declines. Of eight extinct populations, only one had significantly reduced genetic variation compared to an extant population of similar characteristics. Contrary to our prediction that populations would have decreased genetic diversity prior to extinction when compared to persisting populations, at least one measure of genetic diversity was significantly higher in six of the eight extinct populations when compared to extant populations. Simulations lend support to the hypothesis that unaccounted for metapopulation structure may explain the observed pattern in many species. Therefore, models of genetic diversity reflecting population extinction potential may be inadequate for highly-mobile species with metapopulation dynamics such as the Galápagos finches. The online version of this article ( https://doi.org/10.1007/s10592-019-01175-3) contains supplementary material, which is available to authorized users. We thank Terry Chesser and Joel Cracraft of the American Museum of Natural History, and John Dumbacher, Maureen Flannery, Douglas Long and Luis Baptista of the California Academy of Science, and R. Prys-Jones of the British Natural History Museum for access to valuable historical specimens. We thank the Galápagos National Parks and Charles Darwin Research Station for field support. This work was partially supported by the National Science Foundation (DEB-0317687 to KP), Sigma Xi (HLF), The American Ornithologists’ Union (KP and HLF), and the University of Cincinnati University Research Council and Wieman-Wendell grant funds (HLF, KP, LPL).